By adding a form element to your CTA, you can collect contact details and more info from your visitors, quickly and easily. Just click to add an element to a column and choose the "form" element type. Once you've added your form, click on it to show the form settings in the builder panel. In the "fields" settings, you can now enable all of the fields you want to display. 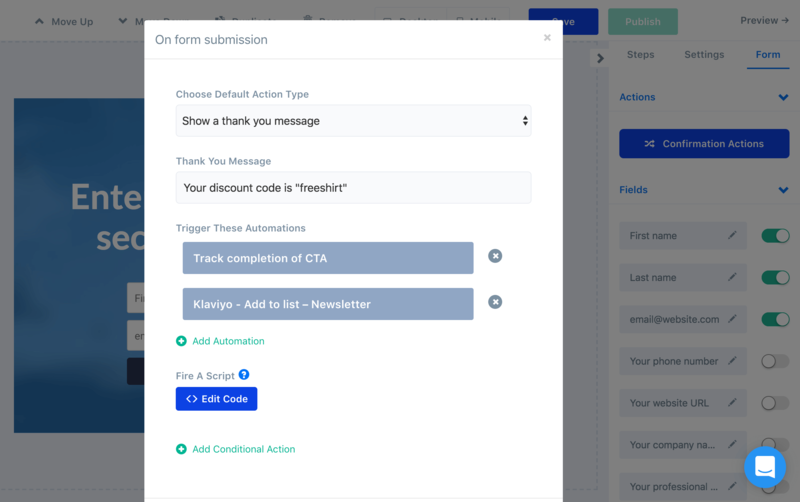 ConvertFlow's form fields come with preset fields already configured for you, helping you collect standard contact information and send it to your email marketing tool or CRM. Each preset field can be edited by clicking on the field setting in the builder panel and adjusting the options in the modal. You can edit the placeholder displayed in the field, add a label, make the field required and more. Scroll below the preset contact fields and you'll find more options you can enable. 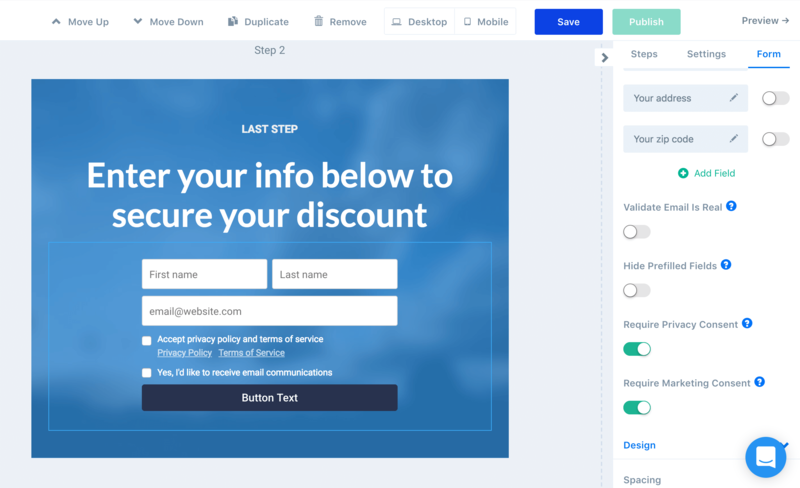 You can optionally have ConvertFlow check that the entered email address is real and exists with their email provider, at the expense of a few seconds of wait time for your visitor. This can help improve your email list quality, sender score and potentially reduce the need to send a double opt-in confirmation email. ConvertFlow uses progressive profiling to remember the information entered by your visitors. If a form displays a field for contact info already known to ConvertFlow, it will pre-fill the field for that visitor. However, you can also have the form hide a pre-filled field entirely. This may make sense depending on the content of your CTA and form. You'll also find options to enable GDPR compliance checkboxes to your form. This is important if you're collecting contact info from European citizens and for being transparent about how you're using the visitor's contact data. Marketing Consent – If your form gates some form of content the visitor is expecting to get, but also opts them into an email list, you can collect consent for ongoing marketing with the "Require Marketing Consent" checkbox. 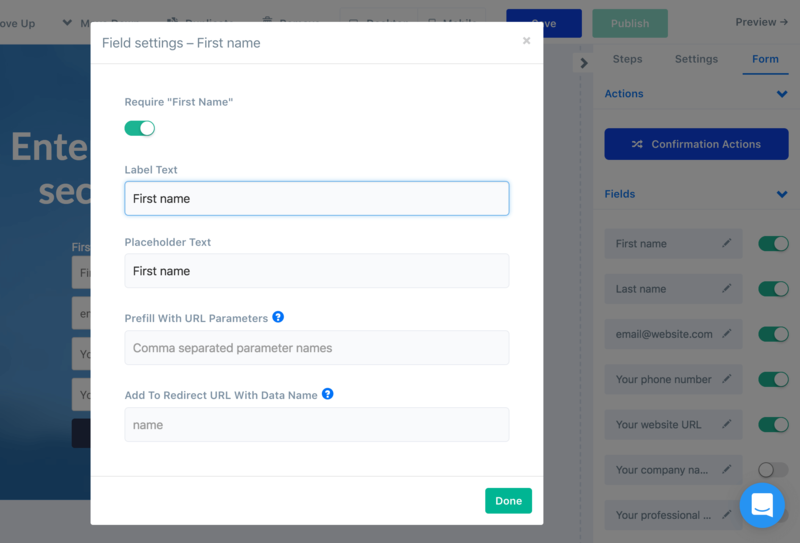 Consent from your visitors can be sent to their subscriber record in your ESP/CRM by mapping these preset fields in your integration settings. By clicking the "+ Add Field" link, you can add as many custom fields to your form as you would link. First, choose a custom field data name. 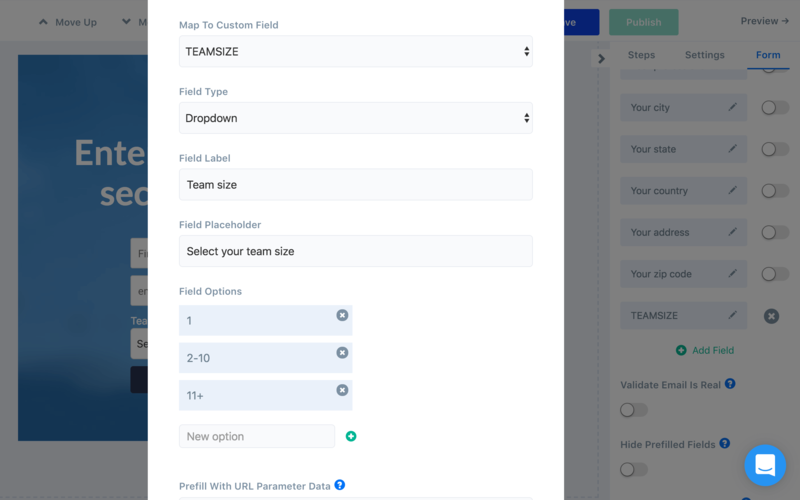 The custom field data name can be for ConvertFlow only, or you can choose from the custom fields created in your integrated ESP/CRM and ConvertFlow will send that custom field info collected by this form to your integrated tool. Next, choose what type of custom field you want to display to your visitor. You can choose between having a text field, dropdown field, radio selection field, paragraph field or a hidden field. Each field type has their own options that can be configured. Drop downs and radio select fields can have options added, you can give the field a label, text fields can have a placeholder display, etc. Pro tip: Want to create a custom checkbox? Create a radio selection field and add only one option. When editing a form, in the builder panel, scroll down past the fields and you'll find your form's design settings. 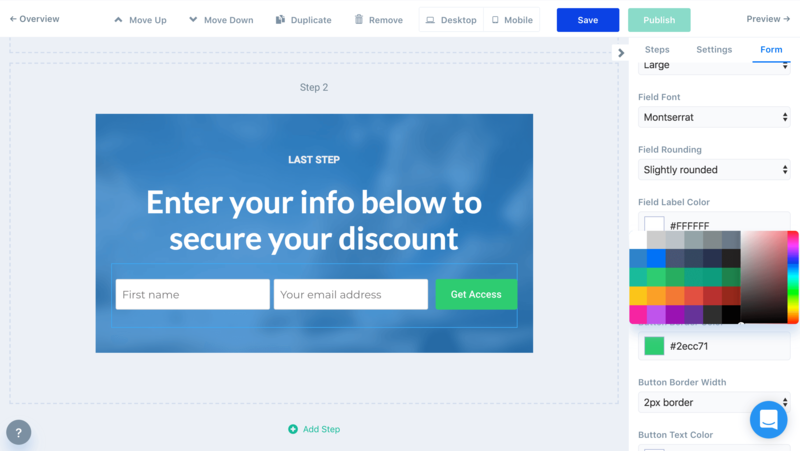 Here you can space your form in your CTA, choose whether you want your form to have a vertical or horizontal field layout, how wide you want your form to expand, the fonts used for your form, button color, button roundness etc. By clicking "Confirmation Actions" at the top of your form settings in the builder panel, you'll be displayed a modal where you can control what happens after someone submits your form. Select the form action you want, and you'll be able to enter the details. 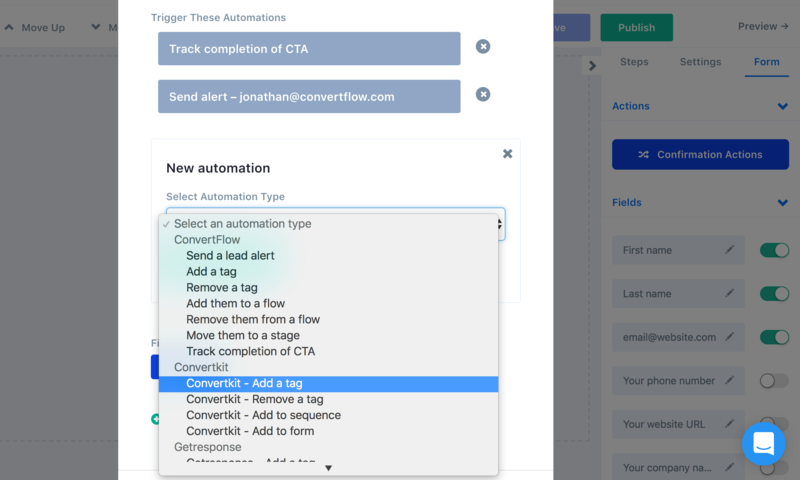 By default, ConvertFlow will perform the confirmation actions you've set. However, there may be scenarios where you want to perform actions only for certain people, such as based on the custom fields they've selected.